2008: Played in 27 games...batted .125 with seven runs scored and five RBIs...had season-best two hits against the University of Missouri-St. Louis...drove in a season-high two-RBIs against Wayne State University. 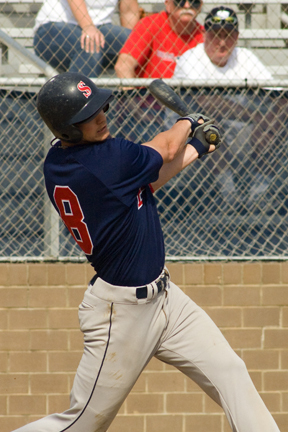 2007: Played in 28 games, splitting time at first base and the outfield...batted .179 with 11 runs scored, 14 RBIs, six doubles, and five stolen bases...had a season-high two hits against Henderson State University and Oakland City University...drove in a season-high two RBIs against Saint Joseph's College. 2006: Played in 47 of 51 games as a freshman...batted .234 with 15 runs scored, six doubles, one triple, one home run, and 13 RBIs...his first collegiate home run was a three-run shot in the road win over Oakland City University...ranked second on the team with nine stolen bases...recorded the team's season-high with seven assists during a win over the University of Missouri-Rolla...had a career-high three hits against Oakland City, the University of Wisconsin-Parkside, and Quincy University...also had a career-best four RBIs against Oakland City. HIGH SCHOOL: Lettered in baseball and basketball at New Palestine High School (New Palestine, Indiana)...helped lead NPHS to the Indiana 3A tournament finals in 2003 and the state championship in 2004...batted .363 as a senior, scoring 38 runs and driving in 19 RBIs. He also posted 13 doubles and two home runs. PERSONAL: Born March 5, 1987...son of Raymond and Lisa Bruce.